Welcome to my blog! I’m a microbiology and molecular genetics graduate student who also happens to like cooking food. Studying cell biology and molecular parasitology is fun but you can’t eat your experiments after you’re finished, unlike cooking (well, most of what I make anyway). The posts may not always be pretty but I’m happy to share my culinary adventures with you, and hope you will enjoy reading about them. 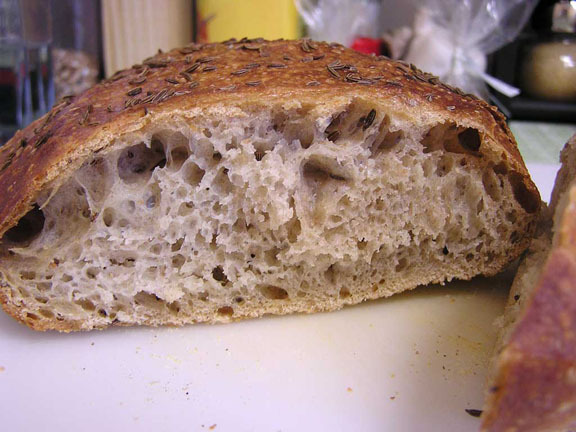 It all started when I got a copy of Artisan Bread in Five Minutes a Day by Jeff Hertzberg and Zoe Francois. As my friends and I were flipping through some gorgeous colour photographs in the middle of the book, one of my friends suddenly stopped at the Deli-Style Rye and exclaimed, “Oh my gosh, it’s Toxo Bread!” The caraway seeds on the loaf of rye had an uncanny resemblance to Toxoplasma gondii tachyzoites, and so Toxo[plasma] Bread was born. What the heck is Toxoplasma gondii? Wikipedia or Google it. Better yet, click here. 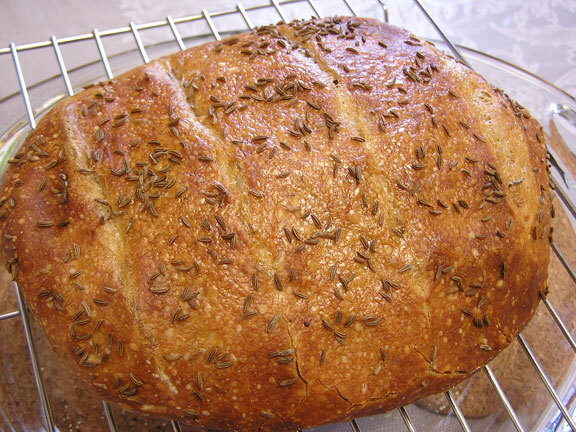 Recipe: from Artisan Bread in Five Minutes a Day by Jeff Hertzberg and Zoe Francois, p. 58. You can also view it here, as posted on The Fresh Loaf. I brought the loaf in to the lab the next day and wish I had taken a photo of what happened. When my PI and I finished our meeting and came out of his office, it was like stumbling on a [food] murder scene: caraway seeds scattered all over the counter, a used knife (!) and a crumpled Post-It note that read, “Toxo Bread! a.k.a. 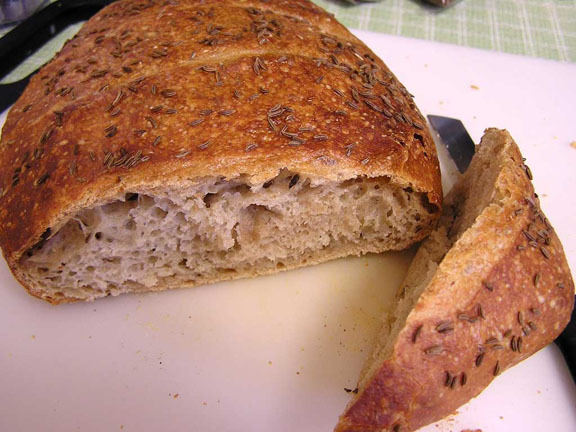 Deli-Style Rye – help yourselves.” There were no crumbs left. That’s right – no crumbs. That night I baked another loaf of Toxo Bread, but shaped as a boule (free-form round loaf) this time. Now that I’ve actually had the chance to taste it, I think it was good but could use a higher proportion of rye flour and the addition of whole wheat flour. Maybe that would make it more rye-ish? There’s definitely a long way to go before I beat Klinger’s rye haha. 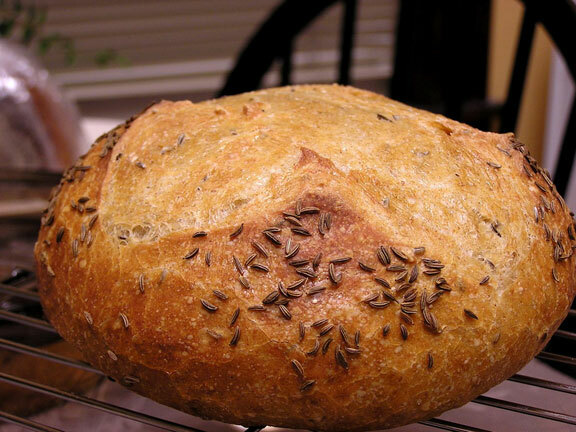 This entry was posted on May 14, 2008 at 1:05 am and is filed under Yeast bread. You can follow any responses to this entry through the RSS 2.0 feed. You can leave a response, or trackback from your own site. I wish you had taken a picture of that (food) murder scene, too – what a Kodak moment, eh? Oh well. Maybe the next loaf you bring in to the lab will be ‘murdered’ similarly, too? Congrats on the new blog, and I will definitely visit frequently! lol. Even though I usually hear things from you first-hand… but no matter! Hi Jackie – I’m very intrigued by you leaving the dough rising in the fridge overnight after shaping it – did you let it return to room temp before you baked it, or did you put it straight in the oven? If you have time, I’d love to hear from you! Thanks a lot! I took the shaped dough out of the refrigerator for about 30 min, while my oven was preheating. The reason that I did this was because I was afraid something bad would happen if I dropped a very cold lump of dough into a preheated 450F Pyrex bowl (that’s how I bake “with steam”). So… the bottom line is that it may depend on what type of bread you’re baking, but your best bet would be to let the loaf warm up for a bit first before putting it in the oven. I hope this helps!